Colchester is a town in Chittenden County, Vermont, United States. The population was 17,067 as of the 2010 census. 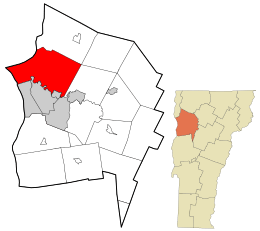 It is the fourth-most populous municipality and second-most populous town in the state of Vermont by population. Colchester is a suburb of Burlington, Vermont's most populous municipality. The town is directly to Burlington's north on the eastern shore of Lake Champlain to the west of the Green Mountains. The Vermont National Guard is based in the town, and it is also home to the campus of Saint Michael's College. About 2,000 years ago, during the Early Woodland period, pre-Columbian natives lived in the area. Chartered June 7, 1763, the town was named for the Earl of Colchester. In 1922, the area of Winooski broke away from the town and formed its own city. As of the census of 2000, there were 16,986 people, 6,144 households, and 4,184 families residing in the town. The population density was 460.5 people per square mile (177.8/km2). There were 6,727 housing units at an average density of 182.4 per square mile (70.4/km2). The racial makeup of the town was 96.53% White, 0.63% African American, 0.17% Native American, 1.58% Asian, 0.04% Pacific Islander, 0.25% from other races, and 0.80% from two or more races. 1.11% of the population were Hispanic or Latino of any race. There were 6,144 households out of which 34.1% had children under the age of 18 living with them, 55.2% were married couples living together, 8.8% had a female householder with no husband present, and 31.9% were non-families. 22.2% of all households were made up of individuals and 5.0% had someone living alone who was 65 years of age or older. The average household size was 2.50 and the average family size was 2.96. In the town, the population was spread out with 22.6% under the age of 18, 16.2% from 18 to 24, 32.1% from 25 to 44, 22.7% from 45 to 64, and 6.4% who were 65 years of age or older. The median age was 33 years. For every 100 females there were 96.0 males. For every 100 females age 18 and over, there were 95.0 males. The Island Line Trail travels from Colchester across Lake Champlain to Grand Isle County; it is a former railroad line. Interstate 89 passes through the area, with exits 16 and 17 serving Colchester. Exit 16 connects to the concurrency of US Routes 2 and 7 (Roosevelt Highway), just north of Winooski. Exit 17 connects to US 2, which goes west to the Champlain Islands, and also to US 7, which heads north toward the town of Milton. In the southeastern part of Colchester, and also along the US Route 7 corridor, bus service is provided by Green Mountain Transit. Colchester, Vermont Facts for Kids. Kiddle Encyclopedia.